Max Presneill is a Los Angeles based artist and curator, originally from London, UK. Currently he is the Head Curator for the Torrance Art Museum as well as Curatorial Director of ARTRA Curatorial (www.artrala.org), an independent curatorial projects management team who organize the CO/LAB art fair for alternative spaces. He has extensive experience internationally as a curator having organized exhibitions for museums, institutes and galleries in the US and UK, the Netherlands, Japan, Mexico, Turkey, Australia, and more. 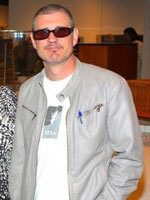 He was the Founder and former Director of Raid Projects (1998 - 2009) - an artists initiative space with global reach - www.raidprojects.com - and Director of the Mark Moore Gallery (2005-8). He was also the founder of Durden & Ray, in 2009, and the Ntopia Group in 2004 (both artist collectives). As an artist he has shown throughout the world including New York, London, Amsterdam, Istanbul, Sydney and Tokyo and is represented by the Garboushian Gallery, Beverly Hills, as well as the Durden & Ray collective. Besides giving regular lectures on professional practices at universities and other venues he has also sat on the panels for the California Community Foundation Fellowship for Visual Artists Grant 2012, the California Association of Museums Annual Conference in 2012 for "Civic Intimacy", the American Association of Museums Annual Conference 2010 for ‘On the Road: Ephemeral Exhibits and The Visitor Experience’, the Contemporary Art Roundtable, organized by CERA, at Pasadena Museum of California Art in 2010 and the City of Los Angeles Public Art Selection Panel for the Metro system, for the same year. He has worked briefly as an art critic, still writes essays occasionally for artist's catalogs as well as for each TAM exhibition catalog and was previously Professor of Fine Art at several universities in the UK and the US - he holds 4 degrees, 3 of which are advanced degrees - teaching on various Bachelor and Master of Fine Arts courses. He has also sat on the Selection Committee’s for NOVA Young Art Fair (Chicago), PULSE Art Fair (New York/Miami/London), the PILOT program and publication (London), and for the McColl Center’s Artist-in-Residence Program, North Carolina amongst others. He has lived in Los Angeles since 2001.